The apartment is adjacent to the “Parque Nacional del Este” (East National Park) of the Dominican Republic and is located 5 Km from the fishing village of Bayahibe; it measures 68 m² with all amenities and is fully equipped. It is situated 30 metres from the private beach of the Cadaques Caribe development, which features a large pool with a bar, a smaller one facing the sea, gardens, a water park and great amenities including shops, bars, cafe and restaurant. It is located close to the town, La Romana, and is within two hours from Santo Domingo. Its location allows beautiful day trips to Isla Saona, Isla Catalina, and Rio Chavon, walking around the “Parque Nacional del Este” (East National Park) by foot or horseback, or simply relaxing in the comfortable private beach facilities. This complex is unusual. It seems like it was a good idea that has not been as successful as expected. If you want peace and quiet, a nice beach and have a car to travel into town it is perfect. The owner was flexible and helpful. The condo is as described and pictured. Thank you for a nice place to stay. I like to know they enjoyed my apartment. I hope when you want it. I appreciate your stay. And I'm glad that your holidays were happy. Excepcional urbanización ,en un lugar paradisiaco , junto a un parque natural para cualquier plan . Hemos pasado una semana y se nos ha hecho cortisimo . Nos ha encantado la experiencia , sirve para todos los planes con amigos , con niños , con familia . El apartamento de Ramiro muy cerca de la playa y muy cómodo para una familia con hijos. Todo facilidades para que disfrutes de una estancia inolvidable en un país que tiene un encanto insuperable . Nos ha parecido idílico y seguro que volveremos. Horas como si fueran minutos mirando al horizonte . Eso si en cuanto se iba el sol había que salir corriendo hacia casa para protegerse de los mosquitos que esperan a los turistas como presa preferida . El servicio muy atento en el complejo, todo muy limpio y cuidado , que más se puede pedir. Si quieres disfrutar del Caribe este es el sitio ideal , cerca de Bayahibe y muy tranquilo para disfrutar de un entorno envidiable . Me alegro mucho de que disfrutaran de sus vacaciones. Y que tengan pensamiento de repetir, saben que serán bien atendidos. Tienen razón en los mosquitos pero como saben la casa está bien equipada con mosquiteras y para el exterior da buen resultado los repelentes que se pueden comprar en la tienda del complejo o llevar en el equipaje. Por último quisiera darle las gracias por su estancia y el cuidado del apartamento. We spent an amazing month in a privileged place. The apartment is 30 meters away from the exclusive beach. We walked every morning around the National Park which is by Cadaques Caribe, where the apartment is located. It is a quite place, but close enough to the different restaurants of Dominicus and Bayahibe. The apartment was comfortable andwell equipped. We want to thanks the owner, Ramiro, for being very thoughfull and for his advices. Apt très propre,plage splendide,nous sommes restés presque 7semaines.nous avions l'intention de retourner .juste un petit bémol ,l'apt est très proche d'un café terrasse et parfois bruyant .mais vers 11hrs P.M ou au plus tard minuit ,tout devient calme. From La Romana, continue onto Higuey Road for 15 Km. At road junction, take road towards Bayahibe. Continue 14 km. Arrive to Dominicus Casino. Follow the road 1 km until arriving at Cadaques Caribe Resort. It is located 120 Km from Santo Domingo Airport, 105 Km from Punta Cana Airport, and 20 Km from La Romana Airport. Transfer from and to the airport is optional. 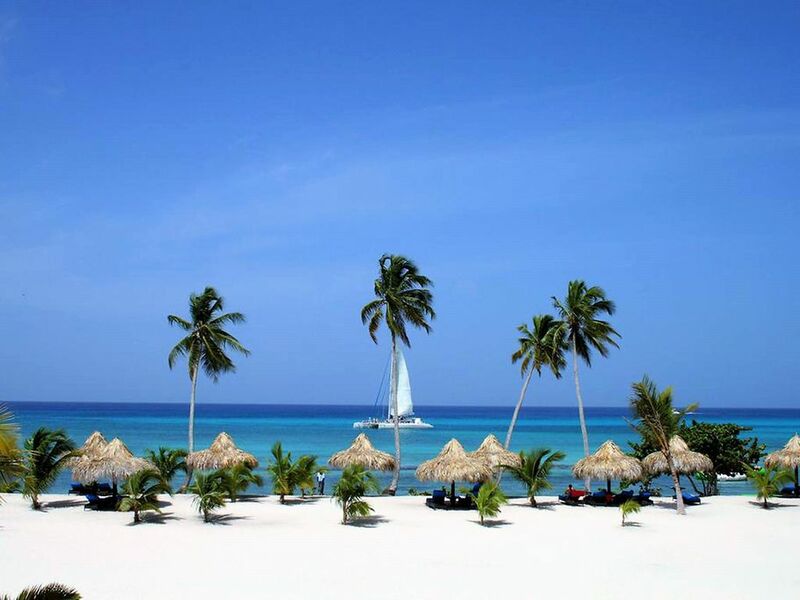 Furthermore, it is located 4 Km from Bayahibe (fishing village) and 2 Km from Dominicus. Ask for optional day trips.